If there is one thing that almost all cultures and religion follow religiously during their wedding celebrations, its henna mehndi designs ! Be it a Muslim wedding or a Punjabi wedding or for that fact a Brahman wedding , Mehndi designs on the hands of bride is going to be a must ! Mehndi in India and many Asian countries is considered auspicious and and India it is a traditional ritual for every bride to be to color her hands with beautiful henna patterns. Mehendi and women go hand in hand, mehendi patterns are loved by women of all age and it can be seen on literally almost all bride’s in India. be it in rural India or Urban , bride’s have their hands decorated with this fragrant natural coolant ! Every girl out there would swear by mehndi which is why we love to decorate hands with it on every possible occasion ! The new age bride prefers to choose a mehndi design according to her taste, comfort and patience level. With mehndi being considered a symbol of bond,happiness and love in a marriage it holds a significant place it the phase of life of a new bride to be. Legend has it that the deeper the mehndi color staining the bride’s hands is equal to highest level of love a groom will have for his bride. Gone are the days when the application of mehndi on the bride’s hand being a low key affair, the new age bride prefers to celebrate the staining of her hands through a glorifying full fledged ceremony called ‘the Mehndi ceremony’ ! It all begun with Bollywood movies from Big banners like Yash Chopra And Karan Johar , who depicted the mehndi ceremony as a a huge celebrating event. Influenced by such movies now almost every new bride wants a blown up version of the mehndi ceremony. In many parts of our country even the grooms are seen with mehndi on their palms which I personally dislike as I feel henna mehndi is all about femininity and should be left alone for girls just like high heels. The art of mehndi has constantly evolved with passing time . A new age bride might prefer a minimalistic approach for her mehndi design and before you know it the trend will change and the brides will be flaunting and going ga ga over elaborate traditional mehandi designs that cover every inch of your hand, starting right from your fingertips to the elbow ! Many bride’s have evolved and given this traditional cover every inch design a miss and opting for creative and artistic art of mehndi a try as they find it difficult to sit through the whole process of mehndi application or simply for the fact that she wants something new. Many bride’s also opt for mehnedi designs which have roots to her birthplace or a design which has a story to tell- like the story of how her soul mate met and the series which followed after it till marriage. The new age bride is all up for experimenting and making designs work which many would have have marked as not worthy for wedding designs, its difficult to tell what is going to stay in vogue. I have fond memories of mehendi being drawn on my sisters hands before her wedding day and I have loved the mehendi ceremony every single time my cousin or a close relative got married. Now we have a separate ceremony just to celebrate the decoration f hands and feet of the bride called the ‘Mehendi ceremony’. In this ceremony the bride to be gets her feet and hands decorated with intricate and the most amazing henna designs. Bride to be’s friends and close relatives dance and have a lot of fun in the mehndi ceremony. Those who prefer professionalism when it comes to mehendi hire paid mehendi artists who decorate hands not just for the bride but for all the guests in attendance. The Bride gets to choose from an array of designs and the guests go for lighter and simpler versions of the henna patterns in order to not overshadow the bride. 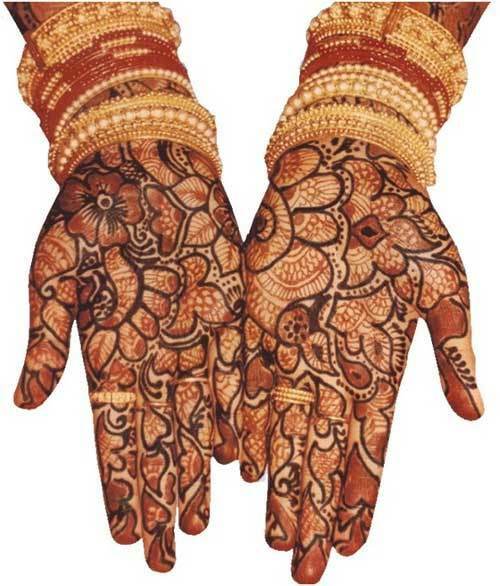 In South India bride must have her hands decorate till her elbows , both on the back of the hands and the front of the hands, long with having her feet decorated . As bridal mehendi has an elaborate design with intricate details , shading and outlining involved the bride is sure to get all tired and bored by the end of the day which is why her family arranges for some fun and games . Its best to get your mehendi done by a professional if you want that picture perfect design but if you are okay with a few flaws you can your popular mehndi artist from your own family, trust me every family have this star woman who draws mehndi like a pro but would never become a mehndi artist for money. With so many inspirations and mehndi patterns the bride’s might have tough time deciding as to which mehndi pattern to go with but worry not we have 90 fresh and trendy styles which will help you choose the perfect mehndi style for this wedding season! These mehendi styles include designs for both hand and feet and you have a lot of choice to pick the right mehendi design for yourself ! Today, we take you through 50 stunning mehendi designs that you are bound to love and with so much variety you have a wide number of designs to select from ! 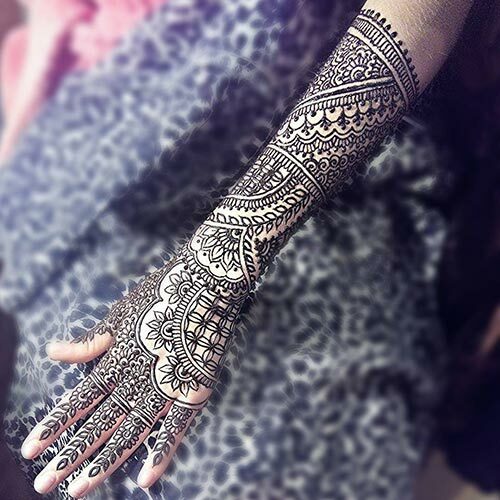 We totally recommend these creative, hatke and mind blowing henna designs , they are sure to make you the star of the crowd and turn heads at your own wedding or that of a friend of yours ! You know love this mehndi design for its unique and trendy at the same time. It has a lot of shaded leaves with thick outlined borders and checkered patterns in between which emphasize the beauty of this mehndi desin. Beautiful trusted paisley and drippy swirl patterns are drawn to create a magnum effect ! A bride can never so no to this as its simple and lovely at the same time! Many bride's love having their and their spouses names initials inked on their palms, and this latest mehndi design is surely gonna be a perfect choice for such bride's. As if flowers and curves weren't enough we have checkered patterns to amplify the beauty of this henna mehndi pattern! You must be living under a rock if you haven't heard of the love radha had for krishna and vice versa and hence what better than bringing their pictures alive to depict your true love to your spouse this wedding ? Boho bride's prefer a much different mehndi when it comes to henna. White henna mehndi is drawn with acrylic paintand this gorgeous design is perfect for the boho loving bride! One of the best heart shaped mehndi designs of 2017 , this lovely arabic mehndi designs have beautiful small sized hearts covered with floral and leaf patterns scattered all over the hand. They make for a lovely sight! Use this mehndi as a form of expression for love! Incorporate the feeling of love with this stunning heart shape mehandi design as marriage is all about love and bonding! We are all up for some trendy patterns which have never been seen on any bride before and one such design is this beautiful design which gives a moment for your jewellery to shine ! Here are a few stunning feet mehndi designs for the bride. A bride not only gets her hands decorated but gets her feet decorated too. Get inspired by these beautiful and latest mehndi designs for feet that will help you stand apart from the crowd. Indians love mehndi as a whole. Mehendi is used almost for everything for hair coloring, For hair masks , henna designs, decorating hands for festivals and weddings. But Mehndi holds a special place in the lives of a bride to be’s life, her mehndi and the color of mehndi is considered auspicious. A Marriage Made in Heaven Or Online?